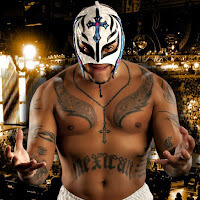 "Right now, the conversation is still in the open with WWE so I am hoping that when the time is right and we sit down to talk about the future of Rey Mysterio with WWE, if there is any future with Rey Mysterio, it is going to be good for both parties as much as it will be good for WWE as it will be good for me. I think it is in the best interest for the both of us. Putting that aside, whatever happens there, hopefully we can continue to do business with 5 Star Wrestling [indie Wrestling in general]. I don't see why not." "Man, there are so many strong names that have been around for quite some time. AJ Styles is one of them. I think that AJ and myself would have a pretty nice run together. Finn Balor, I think I would have a pretty good run with Finn. There are a lot of names that are being thrown out there. If I came back, would I be part of the 205 Live division? Heavyweight division? It is just hard to say. I think that whatever the fans want to see, if I do come back, that is what we will give them."